I’ve had so much fun looking for smoochy photos for this series. Christine & Tyler’s e-session in Newport Beach made me smile. It’s always a treat to see one of my weddings featured on a wedding blog. A big thank you to Lisa and Alix for featuring Wunmi & Olu’s art gallery affair on the Calgary Bride real wedding blog. Check it out. This wedding is also featured the current issue of The Calgary Bridal Guide. Calgary Bride real wedding held at Contemporary Calgary (formerly The Art Gallery of Calgary). Wunmi’s gown was from The Bridal Centre. 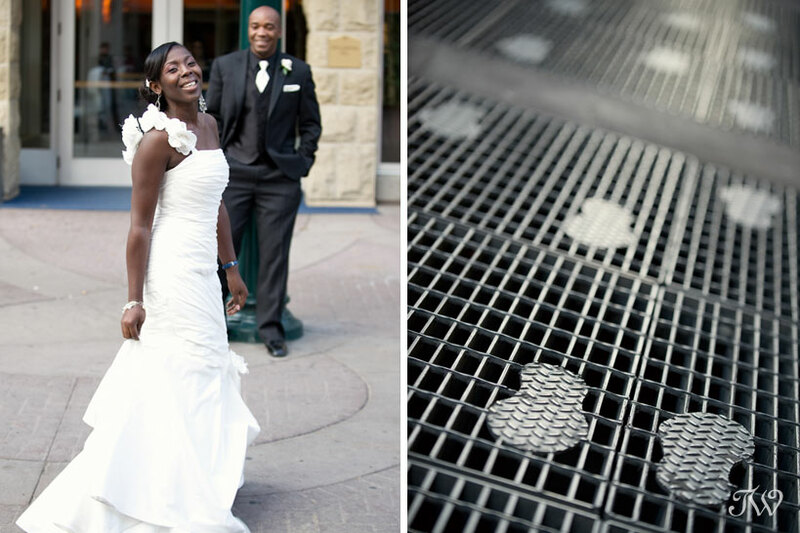 Here’s more from this urban art gallery wedding, if you’d like to see. Be sure to stop back Friday for the launch of a very cool opportunity for Alberta couples getting married in 2011. I’ve joined forces with Anne Wright Photography on the “Love You Back” project. Details to come…. For a few years now, I’ve been offering a package that I call “The First Year”. It’s for couples that are expecting and it’s a fantastic way of documenting the first year of a child’s life, from the maternity session through to the first birthday. It includes 4 mini-sessions and a custom-designed album – a beautiful keepsake. I was thrilled when the sister of one of my former brides, booked a First Year session. We squeezed in a maternity session and just in time because I just received the news that little sister has arrived. I’m looking forward to meeting her soon. If you’re interested in booking a First Year session, please give the studio a call. With two big brothers, I hope the baby doesn’t mind a little rough and tumble. I loved how Sonia had everyone dressed in jewel-tones. So vibrant. In spite of the fact that I’m longing for spring, I couldn’t help but appreciate the beauty of the frost on the trees Friday morning. I headed out to a park near my house to snap a few shots. In my travels, I met Pork Chop. He and his owners were on their way home from school and he made a cameo appearance in my little photo shoot. Nice to meet you. Here’s a little something from a shoot this morning. Corrin & Dave, the frozen fingers were totally worth it.